Asian stocks retreated on Thursday, taking their cues from a subdued session on Wall Street, while the dollar retained gains made after the Federal Reserve's hawkish policy statement. At the end of its two-day meeting, the Fed kept its benchmark interest rate steady as expected, but downplayed weak first-quarter economic growth and emphasized the strength of the labor market, a sign it was still on track for two more rate increases this year. Futures traders are now pricing in a 72 percent chance of a June rate hike, from 63 percent before the Fed's statement, according to the CME Group's FedWatch Tool. 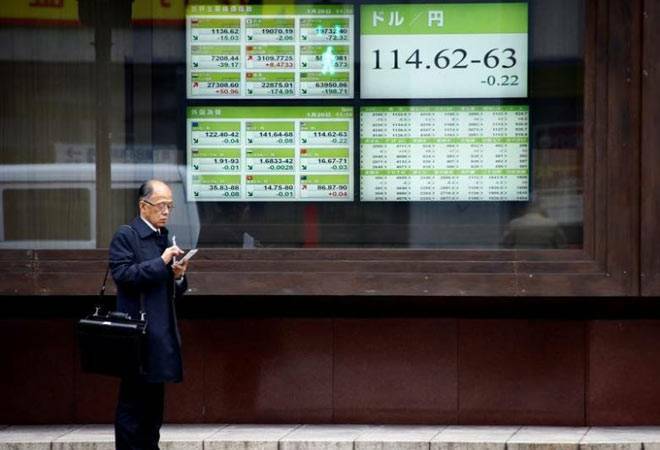 The dollar was slightly higher at 112.78 yen, close to the highest since March 20 touched earlier, after surging 0.6 percent on Wednesday to close at the session high. The dollar index, which tracks the greenback against a basket of trade-weighted peers, climbed 0.1 percent to 99.323, building on Wednesday's 0.2 percent jump. "The key over the coming weeks will be the economic data from the U.S. but, in addition, the (Federal) will be closely watching Washington and negotiations surrounding the new administration's tax cut plans," said Lee Ferridge, head of multi-asset strategy for North America at State Street Global Markets. "Should the data hold up (or better still, improve from here), while the chances of a late summer tax cut agreement remain intact, then the market will likely price in a June move." Attention now turns to U.S. non-farm payrolls for March, due on Friday, after separate data showed private employers added 177,000 jobs in April. That was higher than expected but the smallest increase since October. Economists polled by Reuters expect U.S. private payroll employment likely grew by 185,000 jobs in April, up from 89,000 in March. MSCI's broadest index of Asia-Pacific shares outside Japan slid 0.5 percent on Thursday, dragged lower by commodities, energy and financials stocks. Japan is closed for the Golden Week holiday. Chinese stocks .CSI300 were down 0.3 percent, after growth in China's services sector cooled to its slowest in almost a year in April as fears of slower economic growth dented business confidence. Hong Kong's Hang Seng .HSI dropped 0.6 percent. Australian shares were 0.3 percent lower. "May is a notoriously cruel month for Asia with foreign exchange, equities and domestic bonds all losing in historical average returns," Bank of America Merrill Lynch strategists led by Claudio Piron wrote in a note. South Korea's KOSPI .KS11 bucked the weaker trend, jumping 0.6 percent and hovering just a touch below an all-time high hit earlier in the session on strong corporate earnings. Overnight, Wall Street closed flat to lower. The Nasdaq fell 0.4 percent as Apple shares slid after reporting lower than expected iPhone sales on Tuesday. Facebook and Tesla also dropped during the session and after hours despite upbeat quarterly results, also weighed on the index. Political concerns, which have taken a backseat recently, may re-emerge, with a U.S. House of Representatives vote on a revised bill to repeal Obamacare due later in the session after two failed attempts to corral enough support to pass the legislation. House Majority Leader Kevin McCarthy said Republican leadership is confident there is enough backing for the bill to pass, after key moderate leaders met with President Donald Trump on Wednesday. Even if the bill passes the House, it could face an uphill battle in the Senate. In Europe, Germany ended higher but Britain and France closed lower. The pan-European STOXX 600 index lost 0.04 percent to slip from a 20-month high. The euro was steady at $1.0889 early on Thursday, after losing 0.4 percent on Wednesday. Following a debate between French far-right leader Marine Le Pen and centrist Emmanuel Macron, who will face off in the second round of the Presidential election on Sunday, a poll showed some 63 percent of voters found market favorite Macron to be more convincing. In commodities, oil prices slipped on Thursday after a smaller-than-expected decline in U.S. inventories last week. U.S. crude pulled back 0.25 percent to $47.69 a barrel. On Wednesday, they touched their lowest level in over five weeks before closing higher. Global benchmark Brent fell 0.2 percent to $50.68. Gold inched up 0.2 percent to $1,240.40 an ounce, making up some of Wednesday's 1.5 percent loss, but the stronger dollar capped gains.